L-R Troy Schufft, Janette Illingsworth, Con Katsinas, Michelle Bevan, Helen Wood, Anthony WIlloughby, Kathryn Dent and David Mansfield. Sourcing and placing job-ready candidates eager on a career in hospitality and tourism will be the primary objective of the new National Advisory Board for Employment (NABE), launched this week by the Accommodation Association of Australia. 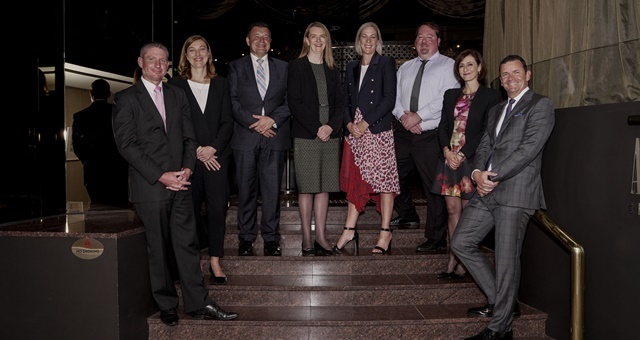 Unveiled this week at a gala event at the Sofitel on Collins, Melbourne, the Board is comprised of 11 esteemed leaders from across the hotel and hospitality industry. The event was hosted by outgoing AAoA CEO, Richard Munro and Association President, Julian Clark. Chaired by IHG’s David Mansfield, the board also comprises Janette Illingsworth, The Star Entertainment Group; Lynda Ugarte, IHG; Michelle Bevan, TFE Hotels; Narelle Glyn, Lancemore Group; Rochelle Choyna, Accor; Con Katsinas, International Hotel Services (IHS); Kathryn Dent, People + Culture Strategies; Anthony Willoughby, Department of Jobs and Small Business; Helen Wood, Hostplus and Troy Schufft, AAoA Academy. With the NABE’s assistance, existing and new job opportunities will be better promoted to job seekers through employment services, with a special emphasis on hiring youth and mature age workers eager to enter or return to the workforce. “NABE’s primary role, is to help open doors by assisting the AAoA academy in placing potential job ready candidates within our industry along with championing everything good about the hospitality industry,” said Chairman David Mansfield.